Well we made it. 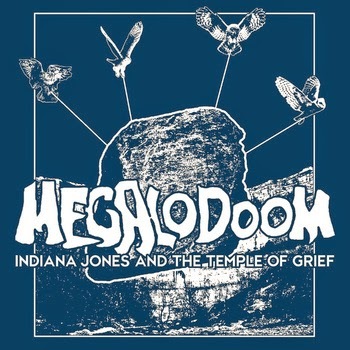 It's the extended Easter weekend and what better way for me to start than with some instrumental doom metal, courtesy of Megalodoom. Their debut EP Indian Jones And The Temple of Doom was released in late 2013 digitally and on tape via Dutch label Tartarus Records and the best new doom label in the UK, Dry Cough Records. The tape comes housed in a swish, screen-printed light blue case and inside the dark blue cassette comes with a free download code. Megalodoom themselves come from Nottingham and feature current and ex-members of Bismuth, Diet Pills, Jesus of Spazzareth, Huffin Paint and Year of The Flood, plus many more. They chose to go down the instrumental route when they couldn't find a suitable vocalist. The thing that always inspires me about doom and sludge is that underneath the vocals, there’s always plenty of great musicianship to get immersed in. Thankfully then, Megalodoom are instrumental so you can dive straight into it. They kick things off with the EP title track and straight away, it’s pure riff worship. It really is immersive music and having the longest song at the start really gets the listener involved early on. The dual guitar attack and the added low end makes everything shake and the drums will make you instantly bang you head, if you happen to catch them live. The other giveaway with their sound is the piercing feedback that adorns the start and finish of the opener. They are more urgent with Vodka Slugs and condense their doom into a quick, sub-four minute burst of groove more akin to sludge. That said though, they do bring the pace down to walking speed towards the end. They are very minimal at times too, leaving the drums and lowly bass to close off the song before one last burst of groove. Since Sabbath poured their black-country misery over rock and created a new genre of metal, bands have been playing their own take on doom (not always very successfully) but not all are brave enough to tackle it without the safety net of vocals, so Megalodoom are letting their instruments do the talking and they’re all the better for it. Super Pursuit Mode feature not often hear treble from the guitars, which adds extra atmosphere to the tape. Another shorter blast by the title of Kali Ma, Shakti De ends it all with more groove and even more prominent jazz elements, including some great drum work. Four tracks isn’t nearly enough here, so if you’re anything like me, you’ll have the tape of repeat. I’m just sorry I haven’t reviewed it until now. You can buy the EP both digitally and on tape from Megalodoom above. Physical tapes have sold out from Tartarus Records.